• Cardiac output (easy setup of stimulation parameters by ergonomically designed knobs and soft keys. Heart Rate (HR). • High rate function for rapid atrial pacing of up to 1,000 ppm (adjustable while applying rapid atrial pacing therapy). 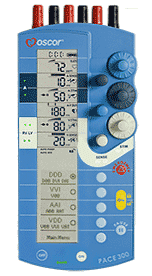 • Activate emergency stimulation mode (D00, 12 V, 80 ppm, BV) by pressing a button (labeled "EMERGENCY"). • Convenient measurement of P/R wave peak amplitudes while pressing a button (labeled "PAUSE"). • PVARP and MTR depending on selected stimulation rate. • Optional AUTO SENSE function which automatically tracks P/R wave peak amplitudes and adjusts atrial and ventricular sensitivities accordingly. • Automatic mode switch to asynchronous modes upon detection of interference (safety feature). • Continuous surveillance of battery exhaustion and pacing lead system integrity (safety feature). • Large backlit display informs quickly about battery status, pacing mode, parameter settings, activated automatic functions and lead system safety surveillance. • LEDs indicate whether knobs for ventricular output and sensitivity apply to RV + LV, RV only or LV only. • Multilingual device messages (English, Spanish, German, French, Italian or Swedish). • Standard 9 Volt alkaline battery provides at least 8 days of continuous operation (DDD, standard pacing parameters). • Optional AC power supply saves battery power. Battery must remain in battery compartment in case of AC power shortage. • Patient cable system features patented connections with protected pins for convenient, reliable electrical connections for optimal patient safety. is the worldwide first temporary three-chamber cardiac pacemaker featuring bi-ventricular pacing capability with individually programmable ventricular pacing and sensing channels and programmable inter-ventricular stimulation delay. The external pacemaker PACE 300 is ideally suited for surgical procedures requiring advanced triple chamber pacemaker settings. The Oscor PACE 300 is compatible with all Oscor temporary pacing leads and temporary pacing lead wires.